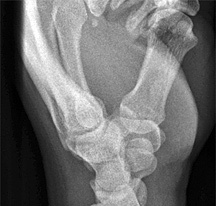 Routine radiographic examination of the wrist is not difficult, but does require some attention to positioning. Keep in mind that to evaluate a joint on X-ray, one must be able to visualize the joint in two planes at 90 degrees to one other. The routine series for a wrist includes PA and lateral views. For further evaluation, oblique projection may also be necessary if trauma or arthritis is evident. Figure 2: PA wrist with hand in gentle fist Technical factors that are important to keep in mind include the following: 10 x 12 inch (24 x 30 cm) crosswise for two or more images on one cassette; for a digital screen, use lead masking to get more than one image one the cassette; for a detail screen, use the tabletop technique; 50-60 kVp range, mAs 4-5; and minimum SID of 100 cm. 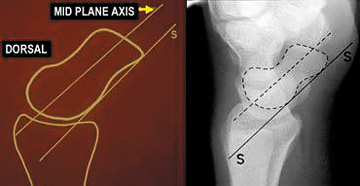 Figure 3: PA wrist When evaluating the PA view of the wrist (Figure 3), the joint spaces of the wrist have a width of 2 mm or less. Only the radiocarpal joint is slightly wider. The carpometacarpal joints are slightly narrower than the midcarpal joints. The capitolunate joint is considered the baseline joint width to which other joint spaces can be compared. Make sure to look at all of them: the radiocarpal, the proximal intercarpal, the midcarpal, the distal intercarpal and the carpometacarpal joint spaces. Figure 4: The carpal arcs The carpal joint spaces should be symmetrical. The cortical margins of the bones should be parallel. One excellent way of looking at the positioning of the carpals is by using three carpal arcs. 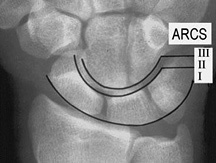 (Figure 4) The first arc is a smooth curve outlining the proximal convexity of the scaphoid, lunate and triquetrum. 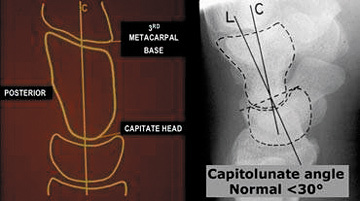 The second arc traces the distal concave surfaces of the same bones, and the third arc follows the main proximal curvatures of the capitate and the hamate. 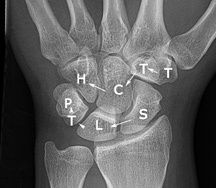 Figure 5: The carpal bones: scaphoid, lunate, triquetrum, pisiform, trapezium, trapezoid, capitate and hamate An arc is disrupted if it cannot be traced smoothly. A break in one of the arcs indicates a fracture or the disruption of a ligament leading to a subluxation or dislocation. 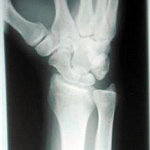 Figure 7: Lateral view of the wrist The lateral radiograph of the wrist is obtained with the arm adducted with the ulnar side of the forearm on the cassette. The elbow is flexed to 90 degrees, adjusting the hand and wrist to make certain they are in a true lateral position. The same technical factors can be used for the lateral projection as for the PA projection. (Figure 6) If an X-ray table is not available, any sturdy table will do. This is a non-bucky technique. Figure 10: Axis of the lunate Since we are discussing the lateral view of the wrist, we can’t ignore the most commonly luxating/dislocating bone in the body, which is the lunate. 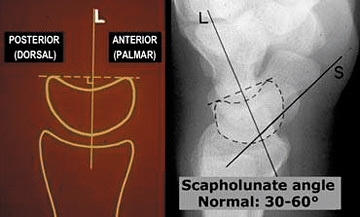 Scapholunate instability can be assessed in the lateral view by measuring the scapholunate angle (30-60 degrees is normal – Figure 10) and the capitolunate angle (<30 degrees is normal – Figure 11). If the lunate is angulated dorsally, it is termed a DISI type of instability, which stands for dorsal intercalated segmental instability. Most agree that anything over 80 degrees for the scapholunate angle indicates instability. 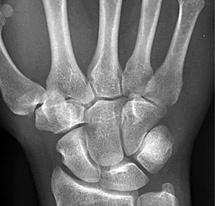 As far as VISI, volar intercalated segmental instability, or palmar flexion instability, when the lunate is tilted palmarly too much, most agree that VISI cases are most likely a normal variant, especially if the wrist is very lax. Figure 13: Oblique wrist demonstrating the trapezio-trapoidal joint Functional views can also be performed if there is a question of ligamentous injury. Radial and ulnar deviation projections place stress on the intercarpal ligaments, which is used most often to evaluate the scaphoid bone. The clenched-fist PA wrist view can be also used to demonstrate a widening of the scapholunate distance. Wrist injuries are common and may lead to degenerative joint disease, which can prove debilitating. A simple wrist series can be quite helpful in evaluating most acute wrist injuries.